I have decided to have a little contest on the old blogerino... a "Where in the World is Quatchi" contest to coincide with the 2010 Olympic Winter Games in Vancouver (every time I write that I imagine Jaques Rouge saying in like wan-couver when he announced we won the games a few years ago... but I digress). A pair of the coveted 2010 Winter Olympic red mittens! So... here is your first "Where in the World is Quatchi" picture... be sure to leave a way for me to contact you in your comment and I will tabulate all the correct answers at the end of the Olympics! Good luck! The small print. Winners must post their guesses on each post by midnight PST on February 28, 2010 to qualify. Other than that all the rules that I make up are in my head at the moment and are subject to change whenever I feel like changing them. 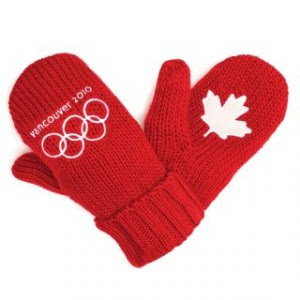 Please also note that I will mail out the mittens the cheapest way possible, so, knowing CanadaPost, you may have these cute mittens in your hands to celebrate the next Olympic games in London 2012. Cause mittens are oh so useful during a summer Olympics. 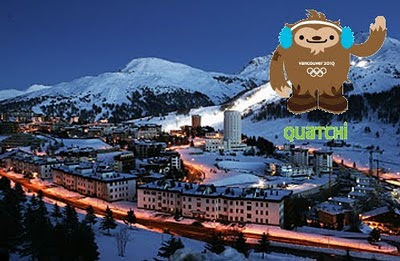 Hint for those that actually read this far.... Quatchi is visiting past Olympic sites around the world. I'm with Kat. Torino, fo sho. My little Quatchi is having an adventure around the world, too!